When was the last time you fasted? I mean really fasted, based on the biblical understanding of this means of grace God has given to us—one that is often neglected? When you fast, do not look somber as the hypocrites do, for they disfigure their faces to show men they are fasting. I tell you the truth, they have received their reward in full. It is as important as it is instructive to note these words from our Lord during His glorious Sermon on the Mount came right on the heels of instructions about “When you give” and “When you pray,” which means that our God elevates fasting to the level of giving and praying. The question is: Have we? 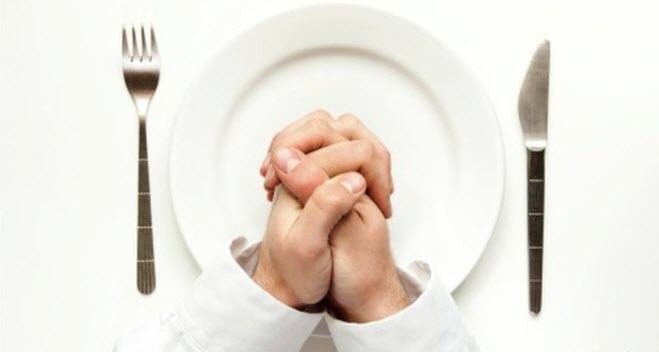 Do we regard fasting as an important aspect of the Christian life? When we go without food for a meal or two, we are expressing our dependence upon God for life itself. Fasting, no less than praying or singing a chorus in church, is a form of worship. We are turning our attention to the Almighty, from whom all our blessings flow. Take just a cursory glance through the Bible and you’ll see why people like David, Nehemiah, Esther, and even Jesus Himself fasted. It is a means of focusing wholly on God and drawing near to Him, a practice which was mandated by God for the people of Israel once each year on the Day of Atonement. We read about fasting while feasting in the eighth chapter of Zechariah’s prophecy. God instructs His people to come to Jerusalem to celebrate with feasting and fellowship while “seeking the Lord Almighty to ask the Lord to bless them” (Zechariah 8:22). For the children of Israel, it was all about an attitude of the heart, not the absence of food. Whenever we draw near to God we are, in some sense, fasting from the stuff of this world. Remember, you can fast from food and still be far away from God. The Pharisees fasted twice a week—to impress the people—and they could not have been farther away from God! They were seeking the applause of man rather than acclaim for God. The Bible makes it clear that there is a special blessing that is only found on the other side of fasting. It is a great blessing to withdraw from table fellowship from time to time in order to totally focus on God. When our stomachs are empty, we can fill ourselves with the presence of Jesus through prayer and meditation, and feast on Him as our only true source of sustenance in this life and the next. It really comes down to why we do something, rather than what we are actually doing. Fasting without focusing on Jesus is not fasting; it is foolishness. It is an empty ritual that cuts us off from growing in our relationship with Christ. So . . . prayerfully consider how God might be moving you to add a bit of fasting to your spiritual disciplines, such as Bible reading, corporate worship, giving, and praying. You’ll be glad you did . . . and God will be glorified.